ChiIL Mama's been running our kindie (kids' indie) press releases on our Facebook Page and Twitter recently and saving the full blown blog posts for original content--ie: our video interviews with bands, live original concert footage & photos and our own reviews. However, FB and Twitter features are difficult to share with friends as links, or search back for later, so we're going to return to our old school approach of running those here as well as on our page and twitter feed. We'll also go back and repost our recent FB/Twitter kindie favorites here, so they'll be more search n share friendly via our side bar search. Summer time is music time...road trip tune time...music fest time. And we can point you in the right direction for some rockin' family friendly releases that will rock your world. 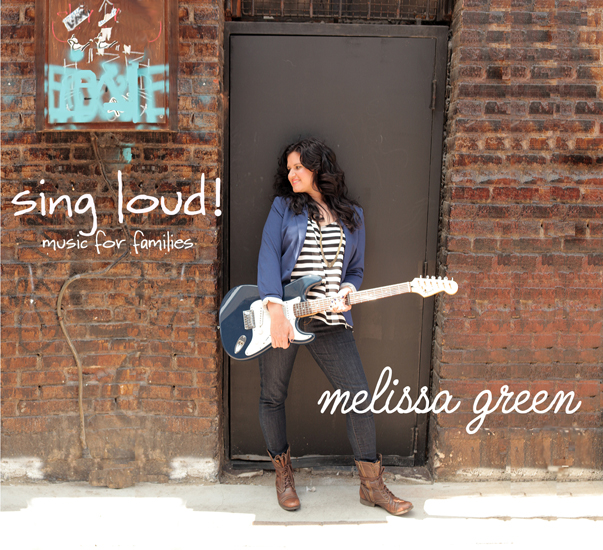 Award winning children's musician Melissa Green looks ahead with pride to the July 31 release of her fourth studio CD, Sing Loud! Featuring two duets that mark the kids' music debut of guest artist Brooke Shields, Sing Loud! celebrates the art of having confidence, being who you are, and empowering yourself with the knowledge that you can do anything you truly set your mind to! Known for her distinctive, warm, "wide open" vocal style, Melissa Green has been writing and performing music for families for nearly a decade. Sing Loud! builds upon her previous work with a new depth of focus that emphasizes individuality, courage, and pride. With the help of producers Lisa Parade and Bob Marlette (Wilson Phillios, Sheryl Crow, Tracy Chapman, Lynyrd Skynyrd), Melissa Green has created a kids' /family album that musically documents her eclectic range of listening favorites: blues, ska, Nashville country, '50s rock 'n' roll, and today's pop, invoking such influences as Johnny Cash, The Noisettes, Indigo Girls, The Romantics, Bob Marley, Ani DiFrancio, the Dixie Chicks, Mumford and Sons, and Eminem. Sing Loud! conveys the message "Stand tall, be proud, have fun, and get up and dance!" Songs run the gamut from invigorating kid anthems like "Heyo,""Sing Loud!" and "Get Up" (which features a chorus from Eminem's "Lose Yourself") and rockabilly tracks like "Aboard That Train" to covers of the Go Go's poppy "We Got the Beat" featuring Brooke Shields and the '70s classic "Free to Be … You and Me." When asked about her collaboration with Brooke Shields, Melissa Green explains, "We met six years ago and have been friendly since then. I knew that Brooke had performed in Broadway musicals (Chicago and The Addams Family), so when I was thinking about a duet partner for Sing Loud!, she came instantly to mind. Brooke said 'yes' right away, and I have to say she is so kind and sweet that recording with her didn't seem at all like work! She came to our sessions rehearsed and ready to go. She was up for everything, singing the songs any way we asked. Brooke has achieved so much in her lifetime, and she's stayed true to herself. I admire her very much, and it was an honor to work with her." While teaching at Beginnings Nursery School in NYC in 2003, Melissa Green began singing with kids. Encouraged by her success, she honed her guitar skills and ultimately became the school's music and movement specialist. Wishing to make her teaching more meaningful for the students, Melissa began writing and recording songs that grew out of their shared experiences. Now living in Los Angeles, Melissa manages to teach music classes and workshops while also maintaining an active national touring schedule. Melissa Green's previous albums include Sweet Little One (2011), Round and Round (2008), and Here We Go (2006). In 2008 she released a DVD, Clap, Shake and Roll, and a song-turned-book, The Seahorse Song. Her music is featured on Putumayo's Rock & Roll Playground (2010), and she was a John Lennon Songwriting Contest finalist for "The Seahorse Song" from Here We Go. Check out Melissa Greeen's main site right here for more details.